with effective Hypnotherapy by Dr. Steve G. Jones! Steve G. Jones, Ed.D., Clinical Hypnotherapist, charges $1,500 for a custom recording and $25,000 for a one-hour private hypnotherapy session at his office. But you can get all the benefits for this low price. Simply listen to the Handle Divorce (for Children) Hypnosis MP3 every night as you go to bed for three weeks and feel the changes happening in your life. You will feel more empowered, more in touch with your true self, and you will truly know that your goals are within your reach. Steve G. Jones achieves AMAZING and LASTING results!!! Hypnosis is the easiest way to affect change in your life because the positive messages go straight to your subconscious mind effortlessly so you can accomplish your goals and reach for the stars!! All you have to do is listen to the Handle Divorce (for Children) Hypnosis MP3 session at night as you go to sleep!!! You’ll hear soft music, the gentle sounds of the beach, and the soothing sound of Steve G. Jones’ voice all working together to bring about positive changes in your life easily and naturally. Steve G. Jones has been helping people improve their lives with hypnosis for over 17 years…now it’s time for him to help YOU… don’t wait, do it NOW !!! you’ll be glad you did. See you at the top! And as you continue to relax, you realize just how strong you are. You are a very mentally strong and emotionally strong person. And you realize that day by day you are becoming more and more happy with your life. You realize that certain things happen in your life and that is okay. You realize that you are wonderful person and other people take certain actions because that is what they want to do. You are still a wonderful person and you always be a wonderful and strong person. And I want you now to realize that your mother and father have made a decision, a decision that is right for the moment, a decision that is fine, a decision that you will be very comfortable with. They have decided that they no longer desire to remain married and that is fine, that is fine. You are very comfortable with that decision. You realize that your self worth comes from inside you and that you are a very powerful person inside. You are emotionally strong. You are mentally strong, that’s right. And you continue to enjoy life and have fun and you realize that your parents love you very much and they have made a decision that is okay and you can be comfortable with that decision and honor that decision and you also honor yourself by treating yourself like a wonderful person because you are a wonderful person and you always treat yourself with respect and you always treat others with respect. You always treat your parents with respect because you a very respectful person and that feels wonderful. So relax now and realize that your life is just fine and it will continue to get better and better and more interesting and more fun and more exciting as you follow your dreams and live your life to the fullest. So relax now and realize that everything is just fine. Divorce is difficult on children as well as the parents. Some children feel the effects of divorce long into adulthood, but it does not have to be that way. With the love and support of the parents, children can learn to cope and adjust to divorce. Divorce is very complicated, but your child should not be wrapped up in the middle. Your child should never have to feel as though he or she has to choose a side. This hypnosis program will help your child through the painful process of divorce. Self-hypnosis is a safe and effective way to help your child cope with divorce. Children are highly suggestible and are very likely to benefit from hypnotherapy. 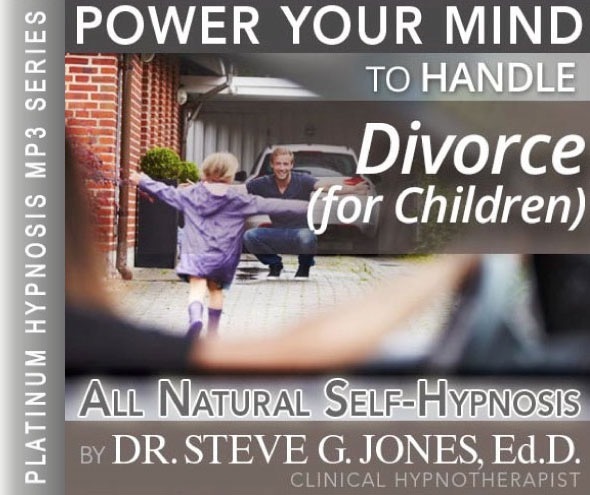 The Handle Divorce (for Children) Hypnosis MP3 recording will give your child positive and helpful suggestions to help them through this difficult time in their life. Children oftentimes do not know how to handle their emotions. Also, it can be hard for a parent to decipher their child’s emotions. 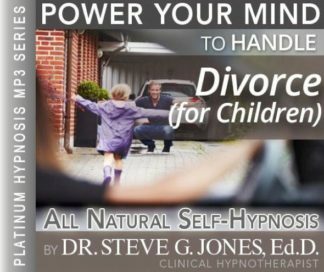 This Handle Divorce (for Children) Hypnosis MP3 audio will give your child the confidence he or she needs during the divorce. It will help with anxiety and negative thoughts. Your child will learn, with the help of the positive suggestion in the hypnosis program, that there is no one to blame for the divorce, especially themselves. Children often blame themselves for a divorce because parents often fight over the child. This powerful hypnosis program will help your child realize that it is not their fault and both of their parents love them very much. We suggest that the program be listened to by your child for 21 nights in a row before bed. We also suggest that the self-hypnosis recording be listened to once a week throughout the divorce process and for a few months after the divorce is finalized. You will want to talk to your child about self-hypnosis and make sure they feel comfortable with it. You can educate them by going to the FAQ’s page on this site. Make sure they feel comfortable with hypnosis and they will receive a lifetime worth of benefit by listening to this hypnotherapy program.